Il y a plusieurs billets, je vous ai offert une vidéo d’un discours qu’a tenu Jason Kenny lorsqu’il était ministre fédéral Conservateur de Citoyenneté et Immigration Canada : Funny what gets dragged from the attic when politics get involved. C’est une vidéo qui a fait jaser au Québec. Dans cette vidéo, il parlait de sa manière de voir le rôle qu’a joué les Britanniques et le multiculturalisme dans le contexte du transfert de la Nouvelle-France. La vidéo a tant fait jaser que Rad-Can sentait le besoin de mettre les choses au clair il y a un couple de jours. Comme j’ai souligné dans le billet ci-dessus, je ne suis pas d’accord avec la caractérisation que nous a présenté Kenny sur les origines des politiques du multiculturalisme moderne du Canada. Toutefois, ceci étant dit, j’ai mentionné que l’approche Britannique quand-même se basait sur une idéologie assez laissez-faire (même malléable et ductile) quant à leur système de gouvernance au cours du siècle suivant le transfert du pouvoir (du moins dans le contexte de l’époque, et surtout comparé aux autres systèmes ailleurs au monde). J’ai mentionné que cette approche elle-même a pu poser les fondements sur lesquels on a pu bâtir un bon nombre de projets de société… des legs dont on ressent toujours, et dont on ne devrait pas considérer sous un angle négatif. C’est une époque dont on ne parle très peu, et qui est très mal comprise. Nous sommes tous le produit de notre passé. Et l’ère des britanniques fait autant partie de notre passé (et de notre identité collective) que l’époque coloniale française, ainsi que tout le kit qui nous est arrivé au vingtième siècle jusqu’au présent – tant au niveau de la société que personnel. Le voici le récit de Rad-Canada. Je le trouve assez intéressant. 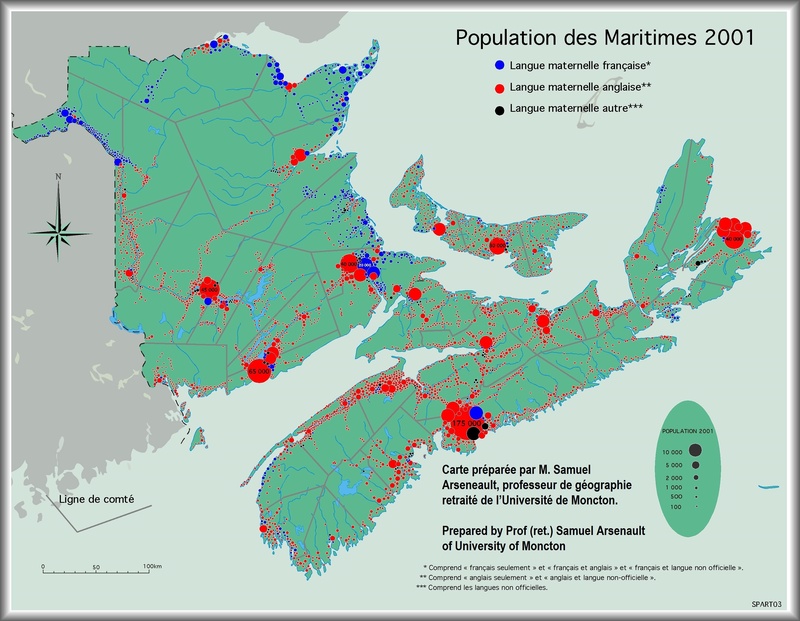 An interesting map of population and community distribution based on linguistic lines (mother tongue) in the Maritime provinces. It’s a bit older now, but the overall Maritimes population distribution has not changed very much since 2001, so it could still be considered reliably accurate. I marked the credits on the map and added it to the post on Acadian accents as reference. Two days ago, I had a very surreal and quite unique experience with Canada’s cultural duality. Canada does not have many “cross-border” towns. We have a few with the United States (where the border divides towns in two), and there are a few border-towns between provinces as well. Cross-border towns are communities which are divided by a border, and which would be “one town” if the border did not exist. Stewart (B.C.) & Hyder (Alaska): When I was a child and living in Terrace B.C, my parents would take us up the road to Hyder to celebrate 4th of July (it was quite close to Terrace). Lloydminster (Alberta & Saskatchewan): This is actually one city, with the Alberta-Saskatchewan border dividing it down the middle along Main Street. I’ve driven through Lloydminster at least once every year, for many many years, on my way to visit relatives. As a city, it is administered in quite a unique fashion: The two provincial governments have agreed that it falls under Alberta sales tax rules, Saskatchewan education system, Alberta health care system, and Saskatchewan’s other municipal regulations – regardless of what side of the border residents live on. Noyes (Minnesota), Pembina (North Dakota) & Emerson (Manitoba). This was basically a tri-border community. I used to work in Emerson, Manitoba for a short period. The US-Canada border was a road on the edge of town. Everyone had friends on the other side of the border. We regularly crossed back and forth for meals, beers, local baseball games, and even groceries. Customs & Immigration officers on both sides of the border knew everyone and everyone knew them (today, when I cross the border at a place like Niagara Falls, and the US inspector asks how many times I’ve been to the USA, I respond in a purposely naive tone “maybe a hundred times or two”, which I know perfectly well will earn me a strange look – lol). However, two days ago I had a border-town experience unlike any other I have experienced before (I’m still shaking my head in disbelief). I drove to Témiscaming, Québec for a business related matter. Usually, people from Toronto think that the closest point to Québec from Toronto would be where the 401 enters Québec on the way to Montréal, or where Gatineau meets Ottawa. But actually, the closest point in Québec to Toronto is Témiscaming. This might actually come as a surprise to most people because Témiscaming is a 6.5 hour drive from Montréal (it is considered quite far “North” for people living in Montréal), and it is a four hour drive from the Western edge of Ottawa. But if you look at a map, it is almost exactly straight North of Toronto. Because of the new limited-access expressway from Toronto to North Bay, 90 minutes has been shaved off the trip. It now only takes three hours and a bit to drive to North Bay from Toronto, and Témiscaming is only a 45 minute drive beyond North Bay. Geographically, Témiscaming is almost cut off from the rest of Québec. 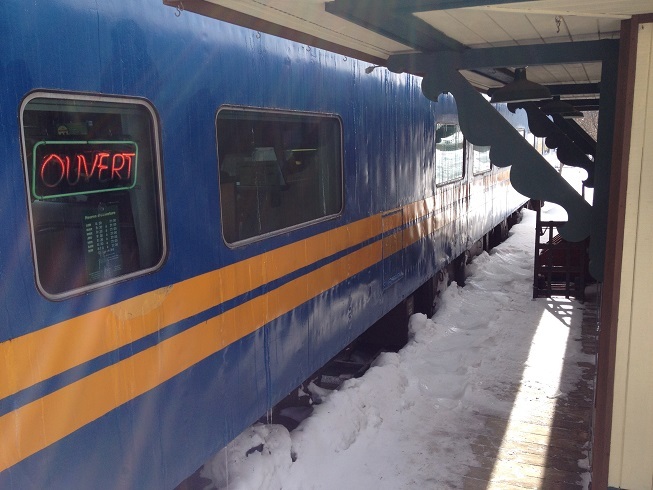 If you want travel to Southern Québec from Témiscaming, you have to travel through Ontario to get there (but there is a road which connects to Northern Québec to Témiscaming). Ironically, their closest major city is Toronto — and North Bay, Ontario is the closest centre for dentists, optometrists, etc. What took me aback was the cultural duality of the town. The town is situated along a very narrow point on the Ottawa River (two short bridges cross the Ottawa River, with each bridge perhaps only a few metres long, with an island in the middle). 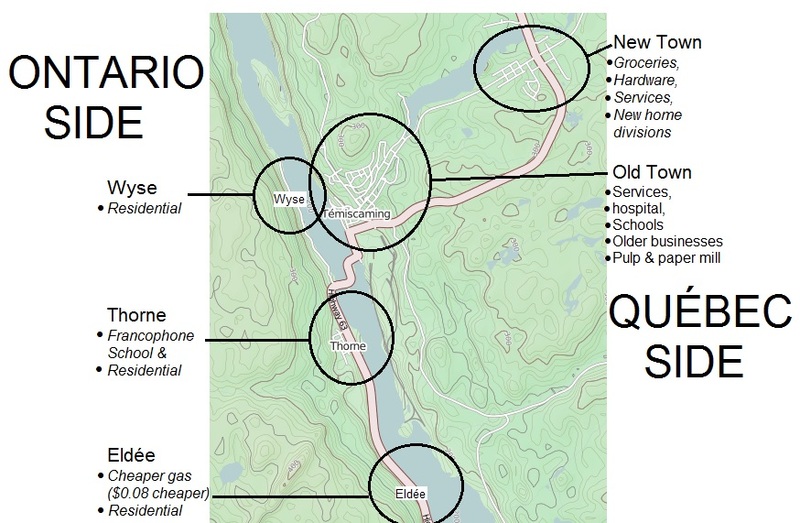 The Ontario side of the river has three satellite communities, Eldee, Thorne and Wyse. These three communities speak French, and the only school on the Ontario side is a Francophone school. The Ontario side counts perhaps has 500 people. On the Québec side, there is the old town of Témiscaming, and a bit further up the road is the new town. 30% of Témiscaming is Anglophone. There is an Anglophone school on the Québec side. The remainder of the town is Francophone, with a Francophone school. The Québec side has around 2800 people. Together, both sides of the border interact and operate as one community. On the Ontario side, when I went to a café and gas station, both times I was greeted and served in French. On the Québec side, when I went to the grocery store, a sales clerk in the isle greeted me in English, but the cashier greeted me in French. When I was standing in line waiting to pay for groceries, the cashier and customer ahead of me obviously knew each other and were friends. 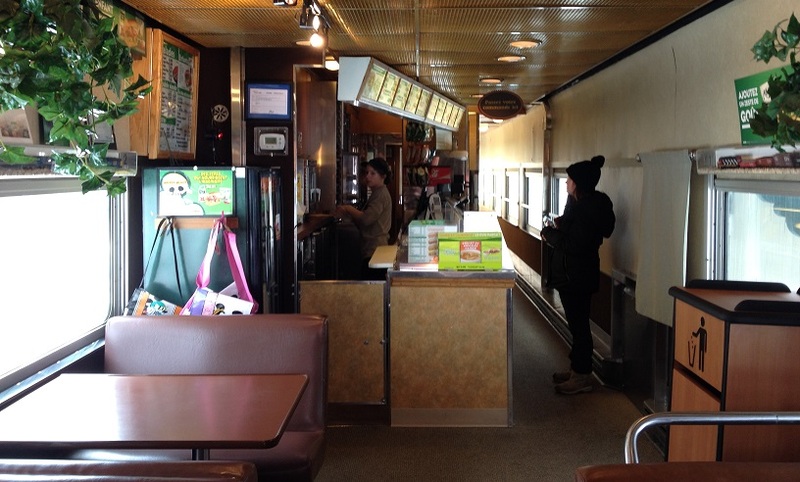 But the cashier spoke to the customer only in French, and the customer spoke to the cashier only in English. They had quite a conversation about their kids who play together, and their husbands. One would speak in one language, and the other would answer in the other language. It was very interesting to witness (many years ago, I once had a colleauge who operated in this manner, he spoke only French when other people spoke to him only in English — but since then, I have never seen this occur before in public). The whole town seemed to operate on along these lines. I went to the hardware store to buy some bindings. I heard the same linguistic quirks there also. A customer spoke French, and the clerk spoke in English. I didn’t know what language to speak (really… how you decide?). I suppose people who live there knows everyone else, and they would know what language to address others in. But it seemed like people just spoke in their own language, regardless of the language of the person they were speaking to, and everyone seemed to be perfectly bilingual. When I went to a restaurant, I heard the staff speak both languages, perfectly bilingual, with no accent in either (I couldn’t tell if they were Anglophone or Francophone). When it came my turn to be served, I uttered an awkward downtown-Montréal-style “Hi, Bonjour!” (I have never done that before, it just came out like that without me even thinking about it – it felt very strange). The waitress said “Bon, mon cher, you can speak whatever language you want! Alors, qu’est ce que je vous sers?” I laughed out loud! (but that didn’t answer my question as to what language to speak — I felt like speaking both — it was just such a unique situation!). I had the chance to ask some people what the heck was going on, and how this even worked. For the most part, I was told that what I observed was correct — that the town operates much along the above lines. Everyone is very bilingual, and people feel comfortable speaking their own language for the sake of simplicity, with no expectation that the response will be in the same language. Everyone understands each other – so it just works. It’s perfect harmony – and there is no assimilation or loss of one’s identity (Francophone children will grow up Francophone, Anglophone children will grow up Anglophone, and they all live together as one cohesive community. Everyone is friends, and everyone has each other’s back, regardless of their home language — like a 1960s love-in!). I don’t ever like to admit it, but “sometimes” I feel uncomfortable speaking English in some areas of Québec. Don’t get me wrong… It’s not because I feel like I would be treated differently, or badly, or anything like that. Probably it has more to do with the fact that I don’t want to make others feel awkward — in the sense that I don’t want others wondering what I’m talking about if they can’t understand me. It’s strange, I know. I know that 99.999999999% of the time it would never be a problem to speak English in a public Francophone environment (just as 99.9999999999% of the time there would never be any issues with a Francophone speaking French in a public environment in Anglophone Canada). I’m probably a bit too sensitive on this front. But the fact that I don’t really have an English accent when I speak French makes it so I know I can just blend in with the crowd — and my brain instinctively switches to French in Québec or other Francophone regions of Canada. But this trip to Témiscaming was the only true time I have ever felt my linguistic compass go completely haywire — I truly did not know what language I should speak. In this sense, Témiscaming would be a documentarist’s dream! What I found particularly interesting was that the notion that Ontario-Québec border did not appear to exist in people’s minds in Greater Témiscaming, regardless of what side of the border people lived on. Elsewhere, people in Québec and Ontario are often very “aware” of the border (I used to live in Gatineau, Québec, so believe me when I say that the border is as much a psychological matter to many Ontarians and Québécois, as it is physical). One resident of Timiscaming told me that the town’s former Loblaws/Provigo closed several months ago. For a period of several months, the only place the town’s residents could purchase groceries was 45 minutes down the road in North Bay, Ontario. People made this commute on a regular basis until the new IGA recently opened in town. Now that Témiscaming has a new supermarket (quite a large one might I add, I was told it employs 100 people), Anglophone Ontarians from as far away as a 25 minute drive on the Ontario side now come to Témiscaming to do their grocery shopping. This adds even more to the cultural diversity of the community. For some, Ontario is good for owning a home, paying cheaper income taxes (for people without children), and for gas (the pump price on the Ontario side is $0.08 cents cheaper). For others, the Québec side is good for owning a home, paying less income tax for families with children, groceries, and services. The main employer is the pulp & paper mill on the Québec side. But if you look at the parking lot, it’s a good mix of Ontario & Québec license plates (just like the rest of town). Témiscaming is the main point of employment for the region on both sides of the border. I was told the only major inconvenience for residents is that Anglophone families on the Ontario side have to send their children by bus 35 minutes down the road to Redbridge, Ontario (they’re not eligible to attend the Anglophone public school on the Québec side, and the Ontario side only has a Francophone school). 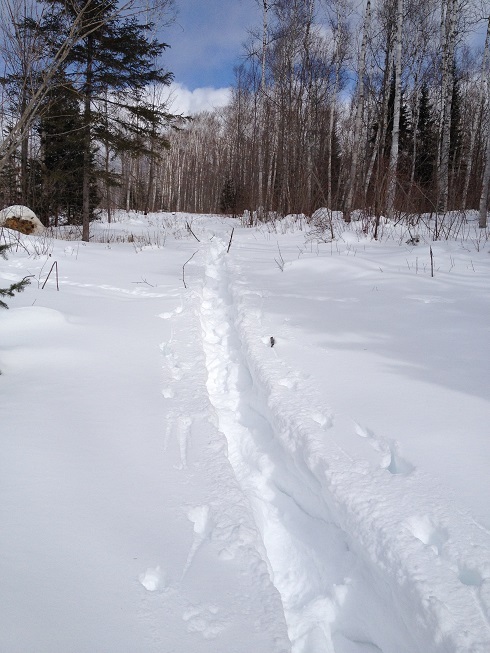 In the end, once I got my business out of the way, I managed to get in a couple of hours of snow-shoeing (I mean, hey – doesn’t everyone always carry an extra pair of snow shoes in their trunk?). The town’s physical setting, with the forests and hills, was breathtaking. The only thing that would have ruined it would have been if a hungry bear happened to see me as I was fighting my way through 4 or 5 feet of snow (Monday’s post could have been my last one if that happened 😉 ). Considering how close Témiscaming is to Toronto, and considering how interesting it is from a cultural perspective, I think I’ll definitely make a point of heading up there with friends for camping this summer. As far as I’m concerned, it’s one of the best kept secrets within a short drive from Toronto.